This 1910 Waterman (4)12 Black Hard Rubber fountain pen has a signed “Sterling” overlay in the Art Nouveau pattern. These rare, early, electroformed silver overlay Watermans, with their recessed barrel overlays, have only before been found signed “Fine Silver” or “.999 Fine Silver,” not signed “Sterling.” I thought it may be an error, but my research clearly shows that the electroforming process can be used with both Fine Silver and Sterling Silver. Right now, this is a one-of-a-kind. Fine, triple-flexible nib. Very nice age patina on the silver (will polish on request). Near mint eyedropper-filler. A fine pen with a lovely nib! 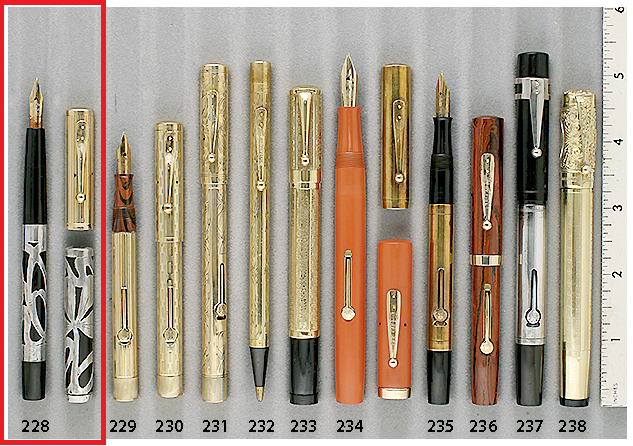 This entry was posted in Vintage Pens and tagged Catalog, Catalogs, Fountain Pens, Waterman. Bookmark the permalink. Follow any comments here with the RSS feed for this post. Post a comment or leave a trackback: Trackback URL.